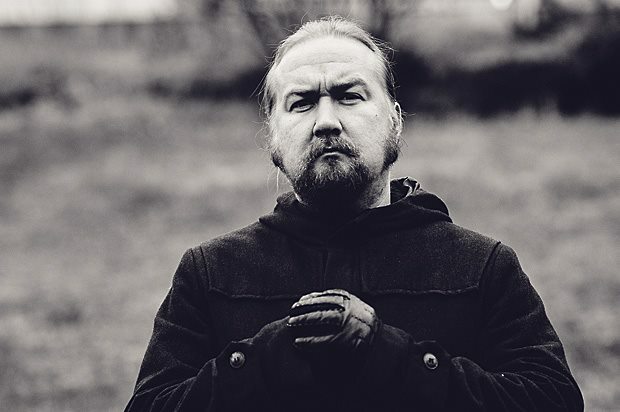 KIMI KARKI "The Tone of My Bones"
Kimi Karki has been involved with many projects in music, and is probably best known for his role in the band Reverend Bizarre, or perhaps Orne and Lord Vicar. His solo work caught our attention here at Wormwood Chronicles, and we set out to talk to the fellow about his new album in such a context; fittingly titled "The Bone of My Bones." The music is a far departure from the typical metallic sounds of the ypical Wormwood fodder, and no traces of doom will be found therein. Instead he has returned with an album of rustic, singer songwriter folk songs, though done in a manner that is all his own, and with some help from a few of his friends. Join us as we talk to a master on this eve, and discuss some of his other projects and doings within both past and present times. WORMWOOD CHRONICLES: It's good to have an artist such as yourself here at Wormwood for such an interview....How did you come to decide the path of your current music, and are you pleased with your new solo album, "The Bone of My Bones"? KIMI KARKI It is a great pleasure to answer an interview which allows me to talk rather freely about music and life. Hails for that! I am currently more or less involved in a variety of bands, including Lord Vicar (doom metal), E-Musikgruppe Lux Ohr (cosmic and ambient), Uhrijuhla (psychedelic pop), and Orne (progressive rock), although the last one is having a long break. And I have indeed made a solo album with a little help from my friends, that is a realisation of my love for folk music with a touch of melancholy. With such a variety of bands I have ways to bring most of my musical ideas into fruition and collaborate with great, creative people. WC: I am told that you are a cultural historian...what are some of your favorite things that involve this line of study? What sorts of historical areas interest you in these studies, personally? How did you get drawn into this study? KK: I started studying cultural history at University of Turku back in 1997, and also did philosophy and comparative religion. I finished my MA in 2002, and have worked at the department ever since. Finished my Licentiate of Philosophy grade in 2008, and am putting the finishing touches to my PhD thesis now. I have been working as a researcher both here and as a visiting fellow at Institute of Popular Music, University of Liverpool, I guess my thing is to be a historian who is interested in these wretched times we now live in... this surrounding, immersive, rather sick media culture. I am currently coordinating IIPC, International Institute for Popular Culture, and two other programs, this includes teaching, administration and some research. My own research field is history of popular music, and my current study is on arena rock spectacles, stage designing and the changes in audiovisual technology. WC: Will you continue to make music with Lord Vicar in the future? What can you tell us about this project and your plans therein? KK: Of course, Lord Vicar is my main band! We are currently working on our third full length album, "Gates of Flesh", and remain hopeful that we could record and release it during 2014. It will be crushing, with some recognisable elements familiar from "Fear No Pain" and "Signs of Osiris", but perhaps we go with a slightly heavier and rawer production this time, trying to capture more of our live energy. WC: It has been said that you did some performances with a 12 string, doing covers of some of your favorite songs...will you tell us a bit about these tunes? KK: I did a bunch of Johnny Cash, Leonard Cohen, and Neil Young songs, also The Doors, Roy Orbison, and acoustic versions of some Lord Vicar and Orne songs. But right from the start there were also some songs that would end up in "The Bone of My Bones". I really like old folk and also some outlaw country, stripped down, bare bones, eye to eye music. There is brutal honesty and intimacy in such music, especially live, you have to be there 100%, every scratch of your fingernails is there to be heard. WC: I found your solo album to be a great, mellow sort of folk music, that makes me think of green woods and water holes...in fact, I put it down for one of my own favorite albums of the year here at WC after a review held in good favor towards it....what was it like recording these songs, and writing material for this album? KK: Thank you, I appreciate your comments! The writing process was very organic, I was doing it slowly, not forcing my Muse. That's how I like to work, with a lot of time, giving songs freedom to get their shape so that they feel true to me. The recording process was a bit hasty because there obviously was a rather limited budget. I did the guitars first, and then had a long break before the vocal takes. Then another break before the mixing process. It is a raw, rather unpolished record, but with a special intimate atmosphere. WC: I found the rendition of Hawthorne's "Young Goodman Brown" to be done in the best tastes...what drew you to this particular tale, besides it being classic? What other sort of literature do you hold to be great in your own interests? KK: I read the short story in an impressionable age, and thought the whole grim story about this idealist who is basically let down by his very community, is a good albeit distinctively pessimistic allegory on the human race. Obviously horror fiction and all kinds of escapist stories have been important for me, I try to read all kinds of literature, from pulp to Nobel winners, there are great sources for inspiration everywhere! WC: Your legacy in Reverend Bizarre is something that any one who listens doom metal would know, surely...what can you say about your era with the band, and your involvement in this style of music? What did you learn from this legacy? KK: Those were the learning years for me as a touring and recording musician. A lot of great memories and friends remain, and Lord Vicar pretty much continues to be part of that scene. I think that Reverend Bizarre was quite unique, in the sense that it constantly mixed popular and avant-garde, the strangest combinations of very precise artistic ideas and nearly infantile humour. That band was extreme in many levels, including the differences we had and sometimes problems with internal chemistry, but also also as popular music that went to charts. I do look back with a knowing smile, now... And have learned to do some things differently, haha! KK: The storytelling was precisely the starting point, the fundamental idea that I wanted to carry out. Take out all the extra clutter and sing about small and big things that have moved me. I guess the conceptual idea and the song title come first, then I simply know, when I get some music, what song it belongs to. And as the last thing I think about the final vocal lines and write the lyrics based on the conceptual idea or the story that I started with. KK: Mat was very nice and easy to work with. I sent him the demos and lyrics beforehand, and he was totally prepared and focused in the studio, very professional. I think his takes on 'Archipelago' are some of the album highlights! Hope there is a chance to collaborate more in the future, who knows... John Ricardson is the Professor of Musicology at University of Turku, and a very capable musician and songwriter as well. Anna-Elena Pääkölä and Pirita Känkänen are great singers whose voices I intuitively thought would blend really well... I am pleased with the outcome, the minimalist honesty of it all. Big thanks belong to Joona Lukala who engineered and mastered the album, and played quite a bit of synth as well... He is a wizard! WC: Do you plan on releasing more of this sort of music in the future? How will you follow this path as a solo artist, if you can foresee it at this time? KK: Yes, I have already written three new songs in that fashion, so it is in the process... Might take a year or two to be pleased with the total chain of songs, but I have the cover art in mind, and the title "Eye for an Eye". It would also be nice to do solo gigs every now and then, so far it has been good in that regard, also internationally. WC: Here at WC, we have an interest in things like the paranormal and of supernature...are you a believer, and if so, perhaps you would share a tale for us on this dark, wintry hour? KK: I guess I am an open-minded agnostic, and have great respect for the power of the mind, art and dreams. My imagination runs wild and sometimes leaves me spellbound by the things I get to witness. Last autumn I stayed at the island of Seili, which used to be a leper colony and later a mental Institute, but is now used by my university as a marine biology lab and a place for seminars and silent contemplation. I was working on my PhD thesis there for a week, away from the usual haste and multitasking. During the final night of my stay I was sleeping alone in this neoclassical gate building which, I later heard, is supposedly haunted. That was the day when the research station kitchen closed and the staff went away for the winter. Solitude, nothing short from "The Shining" kind of vibe. I dreamed about a girl with dark hair and deep dark eyes, kneeling next to my bed and smiling at me, totally silent. I woke up immediately and saw something gray fading away at the exactly same position. An echo of my dream? A ghost? I still don't know, but it was 4 am, I was covered in cold sweat, and it certainly took 45 minutes to get some more sleep. I was happy to get out from there with a ferry next morning, haha! WC: What are some of the albums or artists that you hold valuable as a musician, that have given you great pleasure in listening throughout your times? Thank you, and take care! KK: I guess I always go back to the music of Neil Young. Some of it is relatively bad, actually, but there is always the spirit of searching for something, an inner truth perhaps. He has a childlike fascination for both roots music and experimentation. That innocence and vulnerability, I hope I can keep both the way he has! His best works are like a foundation, they inspire me greatly, from the sad folk ballads to insane feedback noises, from the repetitive riff rock to sublime delay soundscapes. Then, needless to say the obvious, but I say it anyway: early Black Sabbath. There are many classic bands I return to, again and again, but these two are in the marrow of my bone. Cheers for this! There is a surge of my new and old music available: "The Bone of My Bones", obviously, hope you all buy the physical album, as that would prove the power of real music over hype... Svart has also reissued Orne's first album "The Conjuration by the Fire" on vinyl, with some bonus material, and the third Reverend Bizarre album "So Long Suckers!" I hope the vinyl version of the second E-Musikgruppe Lux Ohr album, "Spiralo", will also be available from them by Roadburn festival in April. Just got the cover layout and it will look fantastic! The CD version of the first one, "Kometenbahn", will most certainly be out by then, from Norwegian label Origo Sound. I am in Facebook and Twitter as myself. "Friend" or "follow" me for news, updates, stories or some film or music clips that have moved me somehow. Take care and see you on the road!